It’s been a big week! First, I launched a huge party giveaway with $600 in prizes. (The giveaway is still going – please enter!) In the shop, I added new race car and pink superhero designs. And in both happy and sad news, I said a reluctant farewell to my fantastic printing assistant Stephanie, who’s moving to China for a year (!!). I know she’ll be having a grand adventure living abroad, but I sure will miss her! Water cup races at All for the Boys. 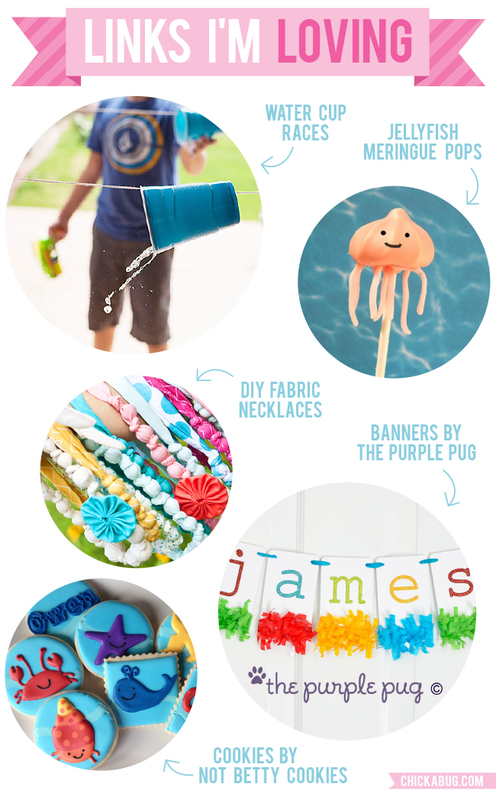 Jellyfish merengue pops tutorial by Party Pinching. DIY fabric necklaces at HowDoesShe. Made with a ‘secret ingredient’… from the dollar store. Banners by The Purple Pug. All hail the glitter queen! 10 summertime s’mores recipes at Best Friends for Frosting. Huge giveaway at Tulip. Win an iPad and all of the supplies you’d need to throw a tshirt tie dye party. Magical Sleeping Beauty party at Hostess with the Mostess. How to make watermelon cupcake toppers at Rose Bakes. Scary Under the Sea cakes at Cake Wrecks. DIY flamingo piñata at Studio DIY. The new goody bags at Sweets & Treats – stripes, dots, chevron, and even quatrefoil patterns. How to make a baby-sized cowboy hat out of felt (why not?!) at This Marvelous Life. Crayon cookies for back-to-school at Munchkin Munchies. A completely adorable teddy bear baby shower at Hostess with the Mostess. Check out past round-ups of “Links I’m Loving” here. You can also follow my special “Links I’m Loving” Pinterest board.